The vast number of utilities under cities can be a challenge for large projects. Using locating tools can help work through the tangle of services already in place. Decades ago, this process involved simply collecting utility records and assuming that they were accurate and complete with no formal verification process in place. Clearly this process, or lack thereof, included a wide margin for risk. To close this margin, most large transportation infrastructure projects, including rapid transit, now incorporate Subsurface Utility Engineering (SUE) at the design phase. It provides a standardized process to verify utility records and gauge completeness, removing the guesswork and risk. SUE requires a professional engineer to provide oversight for the data acquisition and seal data submittals. This fosters accountability, ensuring that individuals involved in the project are adequately qualified and can provide the professional judgement required to carry out the work. Comprised of four data quality levels, SUE involves a mix of records research, geophysical methods, vacuum excavation and land survey techniques which converge to reveal utility data that can be counted on as accurate and complete. This data is leveraged to identify potential conflicts which are then documented in a Utility Conflict Matrix, forming the basis of informed decision making throughout the design phase of a project. From there, a qualified SUE engineer can work alongside municipalities, ministries, private property owners and other stakeholders to review and comment on utility accommodation plans. Infrastructure work in Toronto has provided some good examples of the use of SUE techniques during recent large construction projects. For the Finch West LRT project, utilities were mapped along a 17-km stretch of Finch Avenue, from east of Yonge Street westward to the proposed Humber College Terminal. Additionally, five kilometres of utility mapping was completed on side-streets and major intersections to assist with siting layouts for proposed stations, alternative road designs, potential parking areas and passenger entry/exit structures, while identifying utilities in need of relocation. For the Level B study, all utility information was captured by survey-grade GPS measurements and plotted in digital format adhering to CI-ASCE 38-02 guidelines. 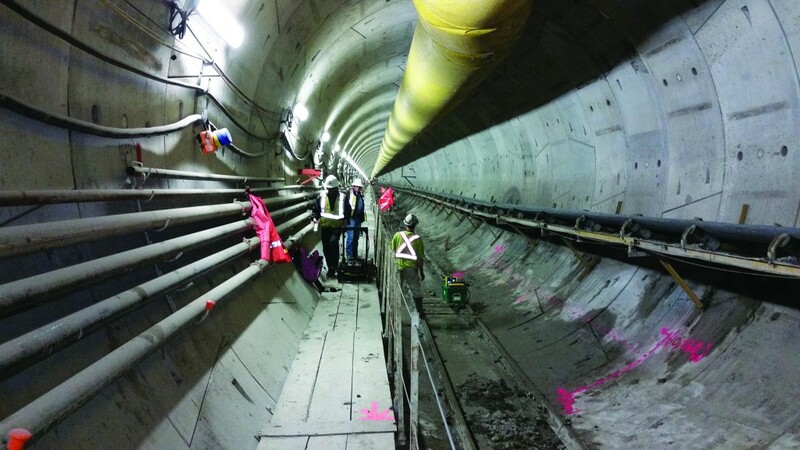 A Level A study was completed in areas where the design team determined that precise horizontal and vertical definition of underground facilities was required. Another LRT project, the Eglinton Crosstown, also required SUE for success. For that project, the study's goal was to map underground utility conflicts to assist with design services for the proposed twin tunnels, including bored tunnels, cut and cover structures, emergency exit buildings, tunnel crossing passages, tunnel boring machine launch shafts, and extraction shafts. The project was completed in two phases: Phase 1 involved the physical delineation of storm and sanitary sewer systems, along with water valve surveying. Phase 2 involved designating and mapping locatable underground utilities across the LRT project area. The SUE process helps to mitigate unplanned utility relocation costs and project schedule impacts.